Submit to the addictiveness of Monster Hunter with MH: Freedom Unite, free for PlayStation Plus members starting Tuesday, 3/25. Take down bizarre creatures and loot their bodies for crafting components so you can make more powerful weapons to take down bigger, badder monsters. If you don’t want to take on enemies alone, you can play with up to 4 of your friends. Even if you can’t pull a group of friends together, you can always hire a Felyne companion in the game, and let’s face it, they are way more adorable than any of your friends. This week for our Spring Fever sale you can pick up Fez on PS4, PS3 and PS Vita at a discount along with a bunch of BioShock markdowns. You can download Monster Hunter Freedom Unite after the PlayStation Store updates tomorrow, 3/25. *The biggest Monster Hunter title to date with over 500 hours of gameplay. *Huge variety of character customizations including 1400 weapons and over 2000 armor sets. *Players can form a team of up to 4 players through Ad-Hoc play and experience the social gaming phenomenon. *AI Felyne companion, who will accompany players on quests and provide aid through the challenging battles. *Fans of the series can transfer their data from Monster Hunter Freedom 2. I will not be first to comment but how cow Blazblue: ChronoPhantasma is a PS3 day 1 digital w PS Plus discount. It is actually! I’ll see if Justin can add that in. I’m looking forward to Bioshock and Monster Hunter! I’ll finally get to check out the Monster Hunter series. I’ve been curious about it. L ooking forward to it. 10 bucks for both Bioshock 1 & 2 is fantastic, but people should just spend double that and get the Ultimate Rapture collection instead. That way you have a physical disc AND all the DLC (Minerva’s Den, anyone?). Omg I thought we were done with these PSP games. Please stop giving us these old PSP games ok? Is that the proper price for Fez for Plus members? Back when Spring Fever 2014 was announced (https://blog.us.playstation.com/2014/03/03/spring-fever-2014-discounts-on-towerfall-fez-and-more/) the price is $9.99 for Plus and $12.99. Is $10.39 the proper price? That number seems a bit…out of place. For those asking yes Fez is cross buy for all 3. Also pretty lame Sony that your not discounting Fez as much as you originally said you would. On the Spring Fever announcement post you said it would be $9.99 for Plus members. Now you want $10.39. Really dissapointed. About the FEZ cross-buy…the answer is YES! PLEASE NO MORE PSP GAMES ON THE VITA IGC. I’d prefer Vita native games on the IGC. Just liked I wouldnt want PS2 games on the PS3’s IGC. $10.39 is with tax I guess? Because the discount for Fez was originally listed as $9.99. Please don’t listen to #13. I’m happy to be getting PSP games. I never had a PSP, so there’s still plenty that I’d like to catch up, and for that matter, I wouldn’t mind seeing more ‘Classics’ for PS3, as well, or at least to see them discounted more often. On another note, I’m disappointed to see that the ‘Minerva’s Den’ Bioshock 2 DLC is not included in the sale. To everybody who is asking: Yes, Fez is a crossbuy. @12 Yeah, because 40 cents is REALLY going to break the bank. @13 You are getting something for FREE. I don’t play those games either but I don’t complain about it. A lot of people just complain in the comments every week over stuff they are getting for free. 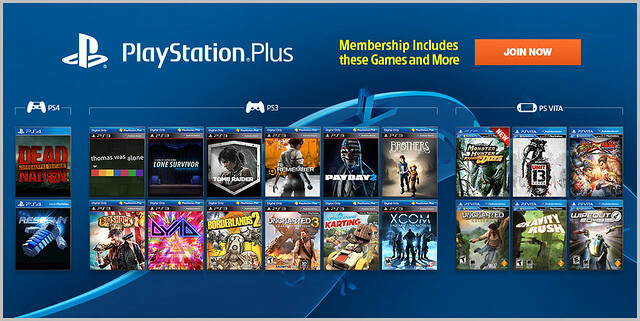 I’ve had Plus since the beginning and got it mainly for the discounts and because I’m a big PS fan. Free games are just a bonus. The exact game you want is almost never going to be offered. I’m surprised some of you aren’t complaining that Second Son isn’t already a Plus game. Please update on time! Also, why couldn’t you discount Fez for PS+ just 40 cents more? Oh, well. Still getting it. @19 The fact is they should have kept their word of making it $9.99. You may be fine with being fooled but not everyone is. Someone can’t go and buy a $10 PSN card to get it now is they main problem. They would have to go and buy an additional $5 or $10 PSN card now see what i’m saying. Looking forward to Fez. Kristine, cant wait to hear your preview for next month on Thursday, always like your narration. I wonder what next months free ps4 game is gonna be? @21, You’re right. I forgot that most of the people who comment here are 11 or 12 years old. you got me there. 5 dollars is a whole weeks allowance! So much money! @17 I’m disappointed that you didn’t go out and buy BioShock Ultimate Rapture Edition, which includes all DLCs for BioShock 1 & 2. To those complaining about PSP titles, they’ve been updated to work on Vita. Correct me if I’m wrong, but the release structure for the Vita is 1 PSP game & 1 dedicated Vita game per month. I don’t personally mind getting a PSP game since I never owned one. I’ve enjoyed having GTA: Liberty City Stories & FF Tactics. Could the staff comment on the delayed PSN updates? I think it’s been 2 weeks in a row they were exceptionally delayed. @21 There is no $5 PSN card…yet. @23 you’ll find out later this week but i’m pretty sure it’s going to be Mercenary Kings. Checked the price of Fez on the monthly announcement last night, 9.99, so bought a 10 dollar card, now for some reason it’s 40 cents more (which in the PS universe essentially means 5 dollars more if using a credit card or pay pal, 10 dollars more if buying a card). I guess I’ll pass. @27 yea my bad. They have a $5 card you can get on Sony Rewards but not at stores I guess. Well that makes it even worse for some people that wanted Fez because now they have to spend $20 just to get it. Nothing for me this week. Hoping fir some great new games come Thursday. Dishonored would be great re6 would also be a nice game to join followed by Okami hd or guacamelee. I agree with the people who are saying no PSP games as one of the two games given each month as it would be like giving ps2 games to ps3 players. Where is Strike Suit Zero?!?!?!? To those complaining about psp games, please speak for yourselves and not for the Vita community. The more great games that PSVITA can get through PS PLUS, the better. Whether it be PS1, PSP or Vita titles. I’m excited to play this Monster Hunter as it will be my first time playing the series, hope I’ll get hooked. If only the PSN Store updated this early……. Seriously though, nothing really for me this week, but whatever. I might as well try Thomas Was Alone and I think I’ll play Tomb Raider again. Not to mention all the Rockstar PS/PS2 classics I bought the past couple months and I’ve been slacking on Grid 2 for a while now. Again, great service that has more than paid for itself. Can’t wait to see what’s in store for April. And the point is two-fold: You don’t up an announced price, and being a paltry number is even more infuriating when (see point 2), you have to add money in at best 5 dollar increments and really 10 dollar increments like you were using tokens not real money. It’s insulting on both fronts and has the feel of being a directional choice to make you add money to your account in these ridiculous 5/10 at a pop amounts. Tl;dr: 40 cents is nothing, the structure of the PSN/SEN wallet is asinine and this is insulting. I’m dissapointed too! I spend the 60 bucks on the last promo to get my 10 dollar code and get FEZ :( And now I have $10.36… It’s wicked. No more PSP games please! Other than that it has been a great month. Do you see now @ae11 when you read the comments here how many people are disappointed with the change in price? If you could just add .40 to your account then it would be fine but fact is people that got the $10 back promo or have ot add another $10 to their account shouldn’t have to when they said it would be $9.99. At least I speak and stand up for the people when you want to have an attitude and try to put people down and say their poor. SMH. How do you pre order Blazblue when it’s not even on the store yet? Ooooookay! Didn’t see this one coming, FEZ 10.39$ O_O. You guys really need more cooperation between teams, cause than Spring fever begun you posted that the price for Fez is going to be 9.99$ CrossBuy for PS+; now is 10.39, why the hell? Guys figure this out before the Update, please! Can i suggest the excellent PSP shooter Resistance: Retribution for next month? Thanks again!